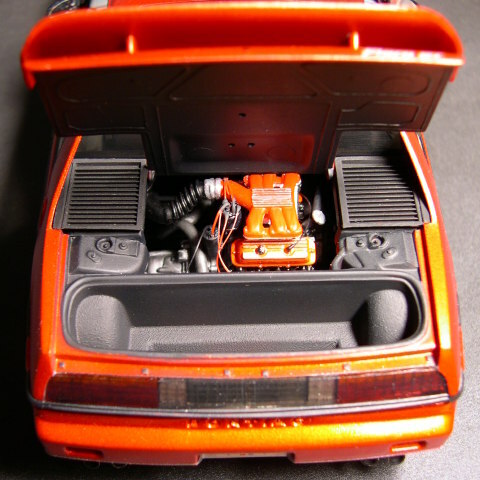 In many ways the Pontiac Fiero was a ground breaking design for GM: its body was constructed out of removable plastic body panels over a steel frame, it was the first mid-rear engined production car for GM and the GT version was equipped with the newly developed L44 2.8ltr V6 engine utilizing Multi-Port Fuel Injection. 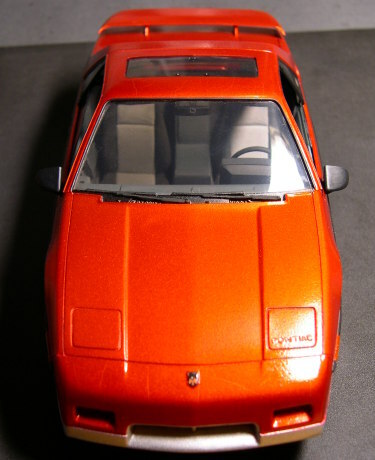 Monogram made an excellent kit of the Fiero: tinted windows, fully detailed suspension, fully detailed engine down to its separate sub frame, full interior details and a number of optional parts for customizing the car. 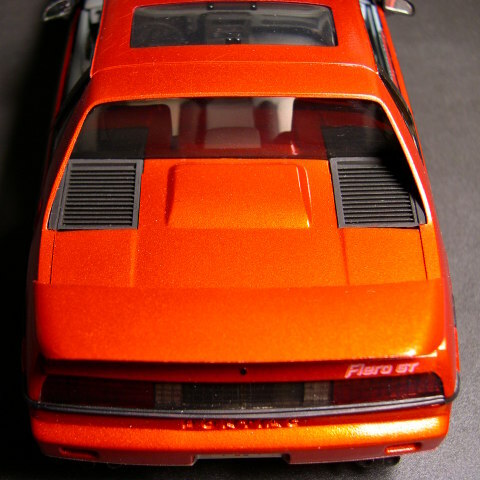 I decided to build my model as a regular Fiero GT without any of the custom parts, the large rear wing was a factory option. This is one of those Monogram kits that is so well detailed that you can actually learn from the model how the real car is constructed. The only construction detail I remember is about the door mirrors which have a tendency to droop, I cured this by drilling out the mounting pins and replacing these with longer ones cut from stainless steel magazine staples. 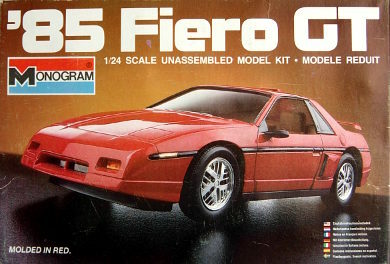 One of the popular body colors for the Fiero was metallic red, there was a choice of overall red or a two-tone scheme with the lower body panels in silver. I prefer the two-tone color scheme because it suits the Fiero better: it makes the car look a bit longer and sleeker. I decided to use Tamiya Acrylics for painting the body because I wanted to try putting a clear coat over a metallic base coat, something I never managed to do successfully using Humbrol enamels. Painting the body Flat Aluminum overall would be the easiest way, but tests showed that the shade of red didn't look right when applied over Aluminum, so I used Copper as a base for the red parts. The Tamiya paint went on fine, but it held some surprises in the long run. The first surprise is a nice one: the body looks a true red by daylight, but the additional lighting I used when taking the pictures made the paint show an orange glow, something I had not noticed before. The second surprise is not so nice: Tamiya Acrylics take a very long time to cure thoroughly, when I took the pictures (some 20 years after finishing the model) it turned out that the top coat had been shrinking and in doing so had developed some hairline cracks (some fine cracks show up on the front bumper in the frontal view picture). I painted the interior in shades of gray that I mixed based on Fiero interior pictures in US car magazines. For the seats I used Tamiya Acrylic flat grays with some additional flat base mixed in, hoping to achieve a velours-like look. The engine bay details were painted according to the Monogram instructions, I added bright aluminum details to the intake plenum and the rocker covers. The inside of the tail lights cluster was first given a wash of thinned black paint to create the black grid lines, then the borders between the lights were painted black and finally the light clusters were painted clear red and the center section clear smoke. The body facing the lights was painted aluminum. Monogram depicted the side marker lights as recessed hatched panels. I painted those panels silver, then applied a couple of thick coats of Micro Scale Kristal Kleer over which I applied clear orange (front) and clear red (rear). 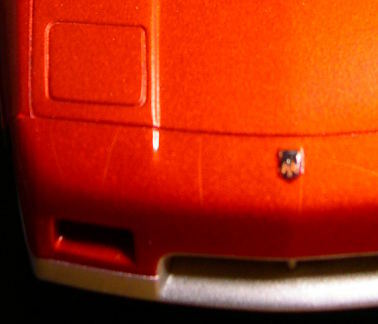 The Fiero badge on the nose was painted black over the clear red and copper coats, then the layers of black and red paint were carefully removed from the raised details until the layer of copper paint emerged. Finally the badge was given a coat of gloss clear. Some thinned flat black Humbrol paint was applied to the seams around the gas cap and the doors. 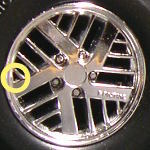 Do remember to paint the five small triangular corners on the wheels flat black (one such corner is circled in yellow on the picture on the left). Date finished: September 19th, 1987.